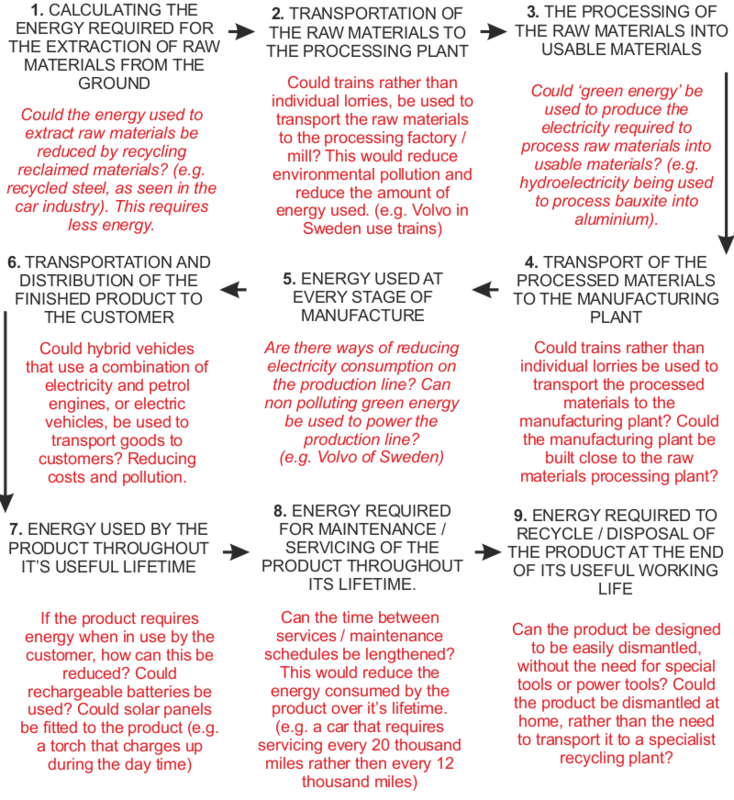 ‘Life Cycle Energy Analysis’, is a method of analysing the way energy is used in the manufacture of a product and throughout it’s useful lifetime. This includes the pollution / environmental damage caused through the use of energy and the product’s carbon footprint. It starts with analysing the energy required to extract raw materials from the ground, followed by the transportation of the materials to the processing plant, processing the raw materials into usable materials, manufacturing a product, the energy consumption throughout the product’s useful life and eventually recycling and disposal. The flow chart below gives a more detailed breakdown of each aspect of life cycle energy analysis. By carrying out this detailed analysis, it makes it possible to find ways of reducing energy consumption and environmental damage. 1. What is ‘Life Cycle energy Analysis? 2. Three stages of ‘Life Cycle Energy Analysis’ are written below. There are many more. For each of the three stages, explain how energy could be saved and give at least one example of how this could be achieved.